Elements Band One, Live Sound Package from HK Audio in the Elements series. Available this year for the first time in the US, HK Audio (Summer NAMM booth 800) offers its Elements modular sound reinforcement systems. Elements enables users to put together a system suitable for every situation using six components. ''The system can be configured to support anything from an intimate speaking engagement to a multi-instrumental concert with a full 3600 watts of front of house power,'' HK says. Due to their modular nature, Elements systems can be expanded rather than replaced as needs change, or reconfigured for specific tasks. In addition to dynamic subwoofers, Elements systems use multiple smaller speakers—a line array—to deliver even coverage and a uniform sound level. The 70 degree dispersion angle is designed to minimize unwanted reflections. The Elements system consists of the following components. 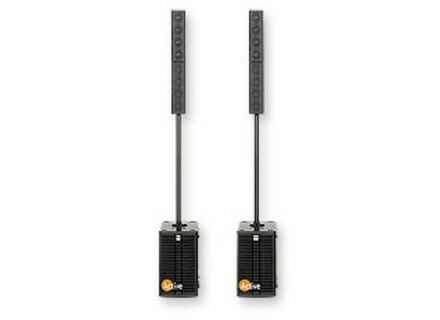 E435: The mid/high unit is made from extruded aluminum, based on line array technology. It houses four 3.5” broadband speakers, and weighs 5.2 pounds. The E435 can connect with other modules. EA600: This amp module blends in with the E435. The Class D power amp puts out 600 watts, enough for four mid/high units or one passive sub and two additional mid/high units. Weighing 6.1 pounds. EF45: This stand is equipped with extendable feet, serving as a base for mid/high units, amp modules or the mounting pole. E110SubA: This portable 10" subwoofer weighs 41.9 pounds. The digital class D power amp provides 600 watts, enough to feed another passive subwoofer or two more mid/high units, the company says. Equipped with two e-connect sockets, the E110SubA also serves as a base for additional elements. E110Sub: For applications requiring more low end, this passive sub is the ideal add-on, according to HK. It is powered by an active E110 or an amp module. To accommodate auxiliary elements, this sub is also equipped with an e-connect socket. EP1: The mounting pole is designed to facilitate rigging up smaller Elements setups. It is continuously adjustable and provides cordless signal routing to the mid/high units. Check out HK Audio for more details. [NAMM] Jensen Jet Electric Lightning 10” Jensen Musical Instrument Speakers announced the latest addition to the Jensen Jet series, the 10” Electric Lightning.